Far from being a defect, a winding thread of odd rings at the border of two sheets of graphene has qualities that may prove valuable to manufacturers, according to Rice University scientists. Graphene, the atom-thick form of carbon, rarely appears as a perfect lattice of chicken wire-like six-atom rings. When grown via chemical vapor deposition, it usually consists of "domains," or separately grown sheets that bloom outward from hot catalysts until they meet up. 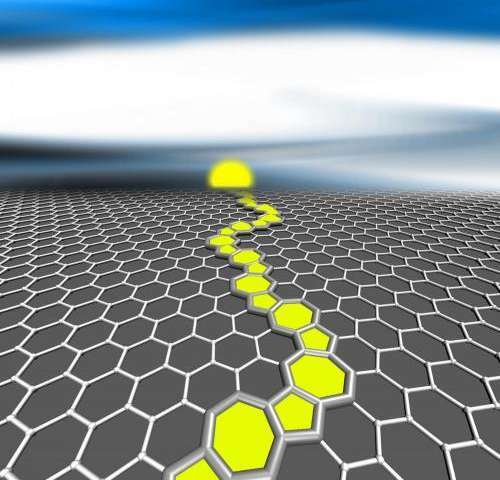 Where they meet, the regular rows of atoms aren't necessarily aligned, so they have to adjust if they are to form a continuous graphene plane. That adjustment appears as a grain boundary, with irregular rows of five- and seven-atom rings that compensate for the angular disparity. The Rice lab of theoretical physicist Boris Yakobson had calculated that rings with seven carbon atoms can be weak spots that lessen the legendary strength of graphene. But new research at Rice shows meandering grain boundaries can, in some cases, toughen what are known as polycrystalline sheets, nearly matching the strength of pristine graphene. Conveniently, they can also create a "sizable electronic transport gap," or band gap, according to the paper. Perfect graphene allows for the ballistic transport of electricity, but electronics require materials that can controllably stop and start the flow. These are known as semiconductors, and the ability to control semiconducting characteristics in graphene (and other two-dimensional materials) is a much-sought goal. In the new work, which appears in Advanced Functional Materials, Yakobson and his team led by postdoctoral researcher Zhuhua Zhang determined that at certain angles, these "sinuous" boundaries relieve stress that would otherwise weaken the sheet. "If stress along the boundary were alleviated, the strength of the graphene would be enhanced," Zhang said. "But this only applies to sinuous grain boundaries as compared with straight boundaries." Yakobson and his team calculate the mechanical strength of grain boundaries to determine how they influence each other: where the boundaries are inclined to bind and where they are likely to break under tensile stress. Grain boundaries could minimize the interface energy between sheets by forming pairs of rings called dislocations, where an atom shifts from one six-member ring to its neighbor to form connected five- and seven-atom units. Sometimes the domains' angles dictate winding rather than straight boundaries. Zhang and his co-authors simulated these sinuous boundaries to measure their tensile strength and band-gap properties. He determined that where these small sections are periodic—that is, when their patterns repeat along the length of the boundary—their qualities apply to the entire polycrystalline sheet. Remarkably, one of his simulations of energetically "preferred" sinuous grain boundaries was a near-perfect match for the asymmetric boundary he spotted in a 2011 paper in the journal Nature. The scanning transmission electron microscopy image showed an atomic grain-boundary structure with a very similar arrangement of dislocations. Only one pair of rings out of the hundred in view was out of place, likely due to a distortion caused by irradiation from the microscope's electron beam, Zhang said. To take advantage of the Rice lab's predictions, scientists would have to figure out how to grow polycrystalline graphene with precise misalignment of the components. This is a tall order, Yakobson said. "But this—so far, hypothetically—can be achieved if graphene nucleates at the polycrystalline metal substrate with prescribed grain orientations so that the emergent carbon isles inherit the misalignment of the template underneath," Yakobson said.